If you read, you learn, and I like doing both. My mate Ken Katafono recommended this paper, which is quite interesting. Is one for the insiders of traceability for compliance, not easy digested, but good stuff. I summarize some areas below, but as always, I recommend going to the original: Hardt, M. J., Flett, K. and Howell, C. J. (2017), Current Barriers to Large-scale Interoperability of Traceability Technology in the Seafood Sector. Interoperability is a critical component of full-chain digital traceability, but is almost nonexistent in the seafood industry. Using both quantitative and qualitative methodology, this study explores the barriers impeding progress toward large-scale interoperability among digital traceability systems in the seafood sector from the perspectives of seafood companies, technology vendors, and supply chains as a whole. We highlight lessons from recent research and field work focused on implementing traceability across full supply chains and make some recommendations for next steps in terms of overcoming challenges and scaling current efforts. Full-chain digital traceability is the use of electronic records and technology both to track the forward movement of a product through various stages of a supply chain and to trace backward the history of that product, including locations, transformations and applications (Bhatt and others 2016). The core question among those trying to solve the global overfishing crisis has thus shifted from what needs to be done, to how can it be done? Interoperability—the ability of different information technology systems or software programs to communicate seamlessly for the purpose of exchanging, interpreting and using data (Bhatt and others 2016)—is a critical component of full-chain digital traceability, but is almost nonexistent in the seafood industry. This study explores the barriers impeding progress towards large-scale interoperability among digital traceability systems in the seafood sector. We define a barrier as an internal or external factor preventing a particular initiative from gaining scalable traction. Barriers can relate to market conditions, human beliefs and behaviors, cultural norms, or wider issues related to the system in which the barrier exists. Barriers are presumed to be movable, given the right design strategy. Scaling issues in promoting and achieving broader adoption. These barriers will manifest more or less strongly depending on the structure of the supply chain, supply chain relationship dynamics, and where a company sits within the supply chain (Sterling and others 2015). In recent decades the seafood industry has experienced an upward trend in seafood supply chain companies adopting and implementing internal traceability technologies—those that enable a company to track and preserve information about individual batches or units as those batches or units are processed within a company's facility. Internal traceability solves most of the food safety and recall needs of the food industry. That function alone, however, is not sufficient for product-level information to be captured, stored and passed along to other trading partners in a manner that provides access to and preserves the integrity of that data so as to maximize traceability benefits across the supply chain, such as by reducing risk and preventing corruption. External traceability—the ability to track key data elements (KDEs) and other information about seafood products as they move between trading partners and through the supply chain—must be in place to achieve that higher level of information capture. External traceability hinges on trading partners making commitments to share relevant information with other trading partners, either in one-up, one-down fashion or via a cloud-based system. External traceability alone, however, does not provide the supply chain transparency, data tracking, or accountability that a company would need in order to ensure that it was not trading in IUU, mislabeled, or fraudulent products—products that, unfortunately, are still prevalent in seafood supply chains. In 2015, Future of Fish (FoF) convened 15 of the leading traceability technology vendors working in the seafood industry and found that while all of these functions were performed by at least 1 of the technology vendors, no single vendor performed all 5 functions. Thus, 2 types of collaborations are necessary in order for full-chain digital traceability to succeed. First, multiple supply chain partners must agree to share some level of data. Second, technology vendors must collaborate around supplying services and products within a specific supply chain so that their systems can effectively communicate and interpret this data (for example, interoperability). The term interoperability, like traceability, means different things to different people and, thus, deserves explanation. Interoperability is the ability of different information technology systems or software programs to communicate seamlessly for the purpose of exchanging and using data (Bhatt and others 2016). For systems to be truly interoperable, they must have both the capacity to share data using a common data format (syntactic interoperability), and the ability to interpret and understand that shared data with common meaning (semantic interoperability). There are currently 3 basic methods for electronically sharing and communicating data. The first, Electronic Data Interchange (EDI), shown in Figure 1, is the oldest and most common form and is used often in eCommerce. EDI relies on a text-based standard for everyday business documents and requires a “middleman” to translate transactions. This middleman, known as a Value Added Network (VAN), is often very expensive, with initial start-up costs ranging from several tens of thousands to hundreds of thousands of dollars, and transaction charges in the thousands per month (Simmons 2007). Although some modern forms of EDI do allow for data sharing directly between Enterprise Resource Planning (ERP) systems, the method remains restricted to node-to-node and does not support full-chain traceability, nor data sharing among multiple systems. Figure 1. Schematic of a typical EDI data-sharing system. The second method of data sharing—and one that is gaining traction—is the use of an Application Program Interface (API). Shown in Figure 2, APIs are custom software interfaces that allow 2 distinct systems to communicate electronically. For example, an API for Microsoft Windows helps programmers know how to configure their software to communicate with a Windows platform. Several seafood traceability technology providers have developed custom APIs that allow 1 or more systems to seamlessly share data with those providers; however, these remain limited to the specific systems for which they were built. In this diagram there are two APIs. The semantic and syntactic definitions are setup to be the same so that communication happens, but this requires programming on both sides. While APIs may embed some global standards, they are not based on any end-to-end semantic or syntactic interoperability standard and, thus, do not allow data sharing and communication across multiple supply chain nodes. The exception to this is when an API is provided as a service across a supply chain; several technology vendors have developed this functionality, allowing multiple nodes in a supply chain to share data. However, the limitation here is that all electronic traceability systems in that supply chain must conform to the specific API of that single traceability technology vendor. This is not a universal API that would allow sharing across multiple supply chains (unless every seafood supply chain globally was using the exact same traceability service provider). The third method of data sharing is a cloud-based ERP system, which tends to be employed mostly by companies with limited technology capacity. Cloud-based ERP systems, shown in Figure 3, require data entry via a browser, which is then shared into a cloud-based database. The information in the database can then be passed, via API or a VAN for EDI, to an ERP system 1 node up or down the supply chain, or to a retailer at the end of the chain. Most often, the host of the cloud-based data system is not a member of the supply chain, but a third-party technology provider. While the cloud-based solution can provide an on-ramp for electronic data sharing to a company without a more sophisticated system, the additional step of manually inputting data into the browser can be very time consuming, and the system is still limited in terms of where data can be shared, requiring a custom API or a more expensive VAN. Figure 3. Cloud-based ERP data sharing system. The seller enters data into their browser, which then connects to the cloud-based ERP. In contrast to the 3 methods described above, true interoperability, depicted in Figure 4, allows for unlimited and unfettered machine-to-machine data sharing and communication. Two systems can share and effectively interpret data without a translation service. Such true interoperability relies on established standards. Although such standards exist, such as GS1, adoption within the seafood industry sector has been almost nonexistent. Figure 4. True interoperability, where machine-to-machine communication can happen without the need of a translator service or any one service provider, allowing cross-supply chain and industry data sharing and communication. Highlight existing initiatives working to overcome these challenges. Our discussion focuses on the barriers to interoperability from the perspectives of seafood companies, technology vendors, and supply chains as a whole. Additional factors, such as value chain type, have also been shown to influence the kinds of barriers preventing interoperability (Bhatt and others 2016). These factors will be important to consider in terms of how seafood companies and technology vendors may need to prioritize strategies for addressing the challenges noted here. To assist with this, we also describe several underlying tensions or counteracting forces that often create inertia or perpetuate the status quo (that is, no interoperability). And, we offer lessons from recent research and field work focused on implementing traceability across full supply chains, and make some recommendations for next steps in terms of overcoming barriers and scaling current efforts. Before interoperability can be implemented, it must be recognized. The barriers described below reflect factors that seem to be preventing companies from becoming aware of interoperability and recognizing its value. These barriers emerged as themes based on a process of pattern-finding to analyze the qualitative data from the online questionnaires. Interoperability requires a level of inter-business collaboration that is unprecedented in the seafood industry. Seafood businesses work on small margins and with a self-protective skepticism around the trustworthiness of competitors and trading partners. They guard their supply chains and sourcing practices closely, fearing that leaked information could damage business and reduce profits. The idea of interoperability—where specific product-level data are shared machine-to-machine all along the supply chain—is not only perceived as too risky, but is also antithetical to current industry culture. Traceability itself is relatively new to the industry, and the concept of interoperability is not even on the radar for many seafood companies. Thus, while the value of interoperability may be clear to those who understand its potential, most seafood executives are either unaware, or downplay the benefits because they are too hypothetical, long-term, or uncertain. The gains companies tend to realize through their traceability systems have to do with internal efficiencies, maintaining contracts with high-value customers, or marketing. Some find it difficult to imagine the complete benefits, especially supply-chain level benefits that interoperability makes possible through robust, end-to-end traceability. Others see the benefits as purely social (such as improvements in human rights across the industry as a whole) and, thus, not within their individual business interests. Making data capture and sustainability information relevant to seafood companies is a challenge, especially when consumer demand for detailed data is perceived as relatively low. Once seafood companies are aware of the value of interoperability, they face new challenges related to implementation. The barriers described below emerged as themes based on a process of pattern finding to analyze the qualitative data from the online questionnaires. Interoperability requires both capital and human resources. Even when a seafood company's leadership sees the potential value of integrating with other systems, the cost of implementation can be prohibitively high. This is especially true for custom ERP systems and legacy systems. Interoperability implementation can require significant attention from IT staff (where such staff exist), many of whom already have more work than they can handle. Seafood companies without IT staff have no choice but to hire an IT consultant to do the work, or to pay the premium that most ERP systems charge for custom integrations. Adding to the financial burden, interoperability implementation and the related back-end code updates can take the entire system offline for weeks. Most companies cannot afford that level of disruption to their operations. In addition to the factors impeding adoption of interoperability among seafood companies, technology vendors face their own barriers when it comes to integrating with other platforms. The following barriers emerged as themes based on a process of pattern finding to analyze the qualitative data from the interviews with technology vendors. While the risks of interoperability perceived by seafood companies concern privacy and security, traceability technology vendors see interoperability as potentially jeopardizing their business futures. They cannot afford the costs to both their bottom lines and their reputations of attempting to interoperate with another vendor—especially a young, unproven start-up, as many traceability vendors still are—without guarantee of success. Some traceability companies have made false claims about the services that they provide and, thus, vendors interested in integrating with other vendors have to do their own vetting process before moving forward with partnerships. Interoperability among vendors occurs most often when integration is requested from their clients (that is, seafood companies), which is relatively rare for the reasons described earlier. The manifold electronic data systems used in the seafood industry presents a significant challenge to interoperability. 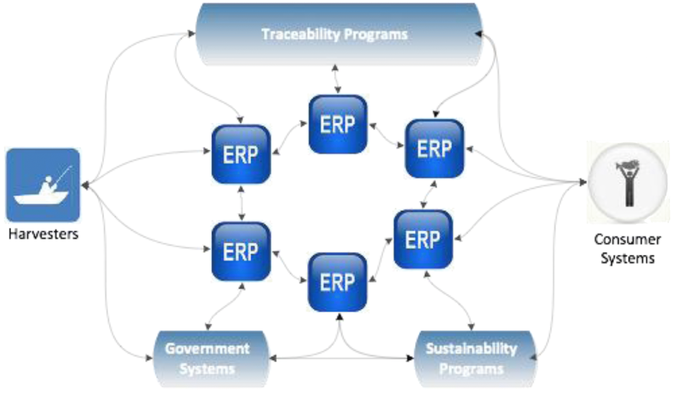 In general, integrating with an ERP system is more straightforward than integrating with a cloud-based traceability system. However, older systems, custom-built systems, and platforms built on obsolete operating systems (Windows 95, for example) can pose incompatibilities that are not rectifiable and, as a result, interoperability partnerships are abandoned. In many cases, interoperability requires system-to-system customization, which when trying to link an entire supply chain may mean designing custom integrations with several very different systems, each built on their own platforms. In the case of both seafood companies and technology vendors, interoperability will only succeed to the extent that all players in the supply chain are willing and active participants. The barriers described below reflect factors that impede entire supply chains from interoperating. These barriers emerged as themes based on a process of pattern-finding to analyze the qualitative data from both the online questionnaires and the interviews with traceability vendors. Interoperability is not simply a decision made between 2 trading partners; all supply chain actors must comply and demonstrate at least a minimum level of commitment. Thus, supply chains that include businesses that lack traceability cannot interoperate; supply chains that include businesses that cannot (for cost or technical reasons) or refuse to integrate their systems even though all other trading partners are on board cannot interoperate. Meanwhile, supply chains that include businesses using traceability technologies that are inferior with respect to data handling or data security, may not realize the full benefits of interoperability, or may decide that interoperating is too risky. This research highlights the range of technological, financial, logistical, and cultural barriers to interoperability currently facing companies and technology vendors working within the seafood supply chain. As with any system-level problem, tackling these barriers in order to scale interoperability requires a comprehensive strategy—one that is beyond the capacity of any single company, government, or organization to achieve. However, individual efforts working in concert can provide the multi-pronged approach necessary to initiate forward progress. The following initiatives are examples of ongoing work to address particular barriers to interoperability in the seafood supply chain. Some of these efforts are more closely coordinated than others. Based on our findings, continued dialogue and knowledge sharing may be fruitful as these projects progress in order to accelerate interoperability and ultimately, adoption of digital traceability systems across seafood supply chains. This project, led by the Institute of Food Technologists’ Global Food Traceability Center (GFTC) is intended to address the growing need for a global, secure, interoperable seafood traceability system by designing a common technology architecture. Details of this work are presented in articles by Bhatt and Gooch (2017), Bhatt and others (2017), and Gooch and others (2017) on pages 22 and 45 of this supplement. FoF is leading efforts to develop novel ways of financing the implementation and long-term maintenance of full-chain traceability. Through this effort we hope to help alleviate some of the burden that interoperability brings, especially to seafood producers and processors. By reinventing the traditional transaction model, this initiative seeks to unlock the full value that accurate, shared data provides to seafood companies, governments, and NGOs and move digital traceability from something currently funded by foundations to an investment made by industry. With the GFTC, FoF is currently under contract with the U.S. Agency for International Development's (USAID) Ocean's and Fisheries Partnership Program to design a technology architecture for interoperable communications between traceability vendors, supply chain members, governments, and others to effectively communicate information that meets the KDE and privacy needs of fishery stakeholders (USAID 2017). The result of this work will be a published and vetted architecture that allows interoperable web services to effectively and efficiently communicate among data technologies. If you build it, they may come; but then again, they might not. When asked, the majority of those involved in the seafood industry—from seafood companies to NGOs to government officials—tend to assume that the biggest hurdle to interoperability is technical in nature. That is, technology vendors still have not done the work to make their systems compatible. Yet, research shows that this is not the case. The technical ability to join 2 data systems has long been available. It is the scaling of that process that remains stalled. Generally speaking, traceability technology providers see value in interoperating, both in terms of services to their clients, for growing their customer bases, and for competitive advantage. Yet, demand for interoperability is currently lagging. Today, technology companies have 2 choices: either pursue interoperability despite lack of customer demand in hopes that existing and future customers will realize the benefits and eventually come on board; or wait for demand to hit critical mass and then spring to action. Either decision requires a leap of faith: the former involves significant upfront investment with no guarantee of returns while the latter risks missing out on the potential advantage of being among the interoperability pioneers. Accelerating buy-in to the value of interoperability (and traceability) requires efforts to align supply chains and effectively strategize solutions to the cultural elements and relationship dynamics in the system. The good news is that these efforts have already begun. A primary goal of the current interoperability initiatives outlined here, and highlighted in this supplement, is to help mitigate risk for technology companies, and to support the seafood industry as it transitions to digital traceability solutions. Current efforts to interoperate are stuck at the small scale. But the barriers impeding progress can be moved—especially now that they have been identified in a more holistic fashion. The subsequent articles in this Supplement provide further insight and opportunities for how we can leverage these insights for continued progress.